Fire officials on Sunday said an unattended cooking fire sparked the Chino blaze that has charred more than 1,000 acres and triggered a smoke advisory for areas in the Inland Empire. As of 6 p.m. Sunday, the fire had grown to 1,020 acres and was 35 percent contained, Cal Fire officials said. 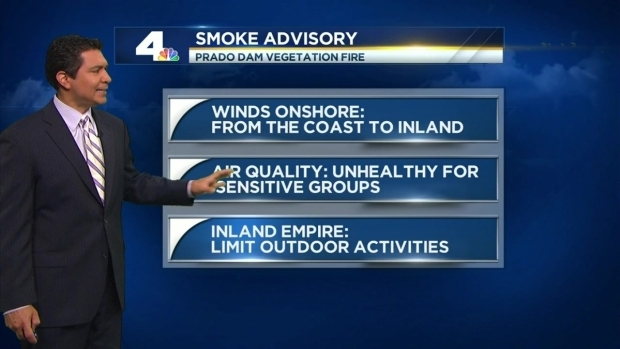 Smoke was expected to travel inland on Sunday, according to NBC4 meteorologist Shanna Mendiola. People reported smoke to emergency responders in Simi Valley that the Ventura County Fire Department determined came from the burning brush fire, about an 80-mile drive away, authorities said. The Inland Empire was under a smoke advisory due to the Prado Dam brush fire in Chino. The air quality could be unhealthy for sensitive groups. Anthony Yanez provides details on the advisory on Sunday, April 19, 2015. "If you are seeing or smelling smoke in the air and cannot identify an area that it is coming from it may be from the Highway Fire," a Simi Valley Police Department release said, using law enforcement's nickname for the fire. 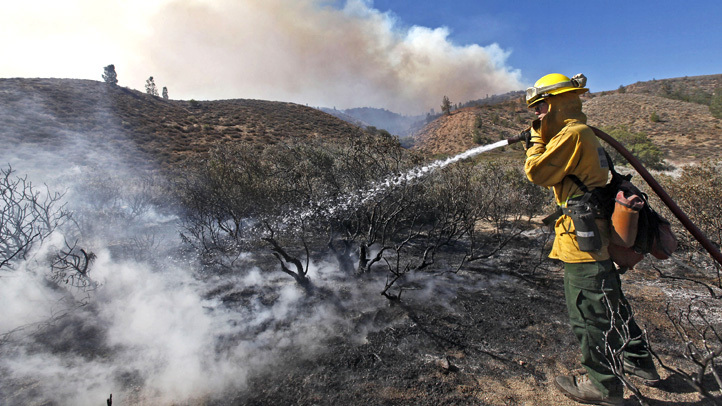 Dry conditions from California's extreme drought, now in its fourth year, contributed to the fire's rapid spread. The South Coast Air Quality Management District issued a smoke advisory for parts of the Inland Empire Saturday, saying some area may have air that's unhealthy to breathe for sensitive groups. Likely areas to experience this air include the northwest, southwest and parts of the central San Bernardino Valley and the Norco and Corona area. The air quality would be poor for several days, as firefighters took on the fire, Mendiola said. Winds, temperatures and dry air help fuel a fire, Mendiola said, but she expected help on several of those fronts. Calm in the morning, winds were expected to pick up Sunday evening, possibly pushing smoke toward that Coachella Valley, Mendiola said. Cool temperatures in the mid-70s were also forecasted, and a storm was possible later in the week, according to NBC4's forecasts. Fueled by California's drought, a large brush fire burning in Riverside County may bring smoky, unhealthy air to parts of the Inland Empire. NBC4 Shanna Mendiola has the fire-related forecast on Sunday, April 19, 2015. Dry air in the area would continue to provide fuel for the fire, Mendiola said, but the cool, onshore wind would bring moisture that could temper the fire's strength. Cal Fire Capt. Mike Mohler said added humidity in the air helped stymie the spread of the fire.